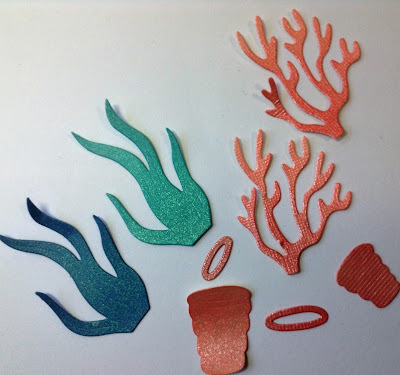 Dies R Us: More Under The Sea Fun! Good morning friends, Birgit here with you today and I've got more cards for you from Under The Sea. 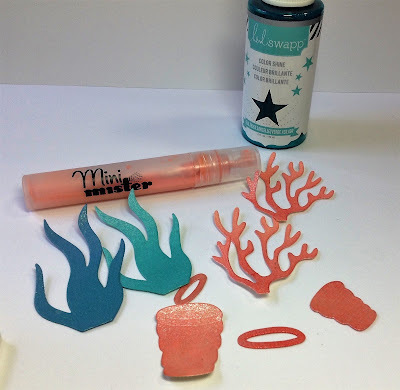 I started by cutting some Elizabeth Craft Designs Seaweed out of colored card stock and sprayed each piece of seaweed with similar colored shimmery mists by Heidi Swapp. That gave the seaweed a nice shimmery shine! 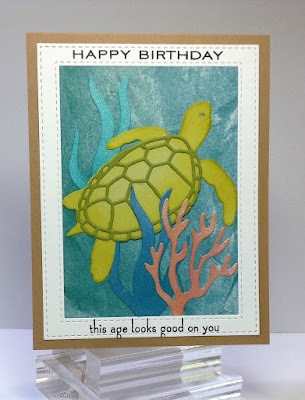 For this card, I cut the Elizabeth Craft Designs Turtle out of two shades of green and added some color around the body of the turtle using distress ink. For the background of this card, I rubbed in some distress inks in greens and blues on the top portion and masked off the bottom section which I distressed using tattered straw and a darker brown. I spritzed the background with water to remove some color and then spritzed on more Heidi Swapp shimmer spray. 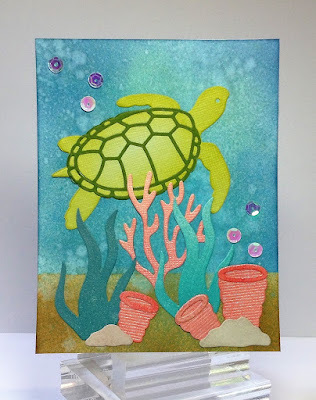 Once it was dry I adhered the turtle, layered the seaweed and added some iridescent sequins to look like water bubbles. I left this card without a sentiment and sent it to a very dear friend of mine. 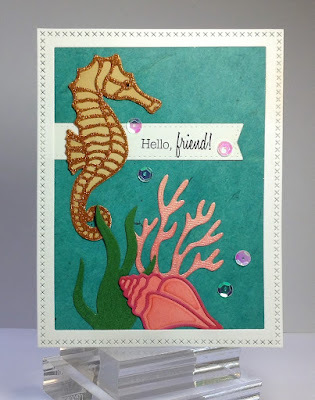 On these next two cards I used some old printed scrapbook paper for the backgrounds and used the Elizabeth Craft Designs Seahorse and seaweed for a quick and easy card. I added some saffron colored Silk Microfine Glitter from Elizabeth Craft Designs to the outline part of this seahorse die. It's really pretty in real life, the way it shimmers and shines. The large seashell is from Elizabeth Craft Designs Large Shells. 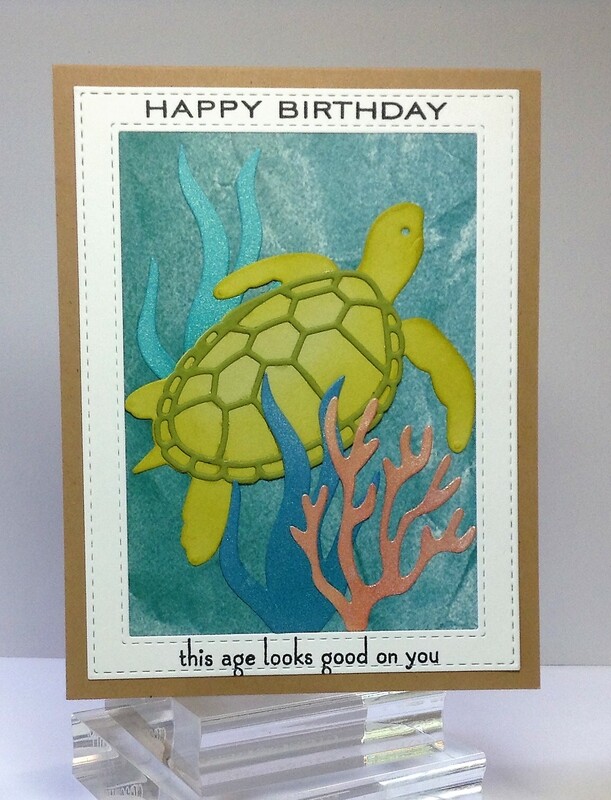 Another great collection of underwater scene cards Birgit! You have created some fanrtastic scenes, love the sea horse ones. Great tutorial, thank you! WOW these are just awesome Birgit! Thank for all the wonderful tips/tricks and inspiration! Birgit, these are beautiful and imaginative! Thank you for showing how the elements were colored and shaded! 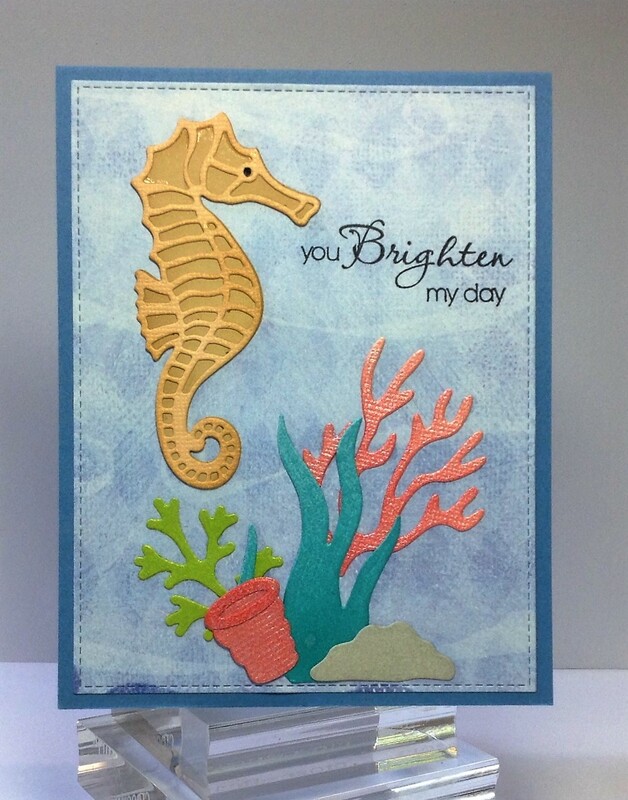 Thanks for sharing your beautiful cards and those Elizabeth Craft Design dies. They are adorable and you get so many to each set. Beautiful underwater scene. So fun and cute.